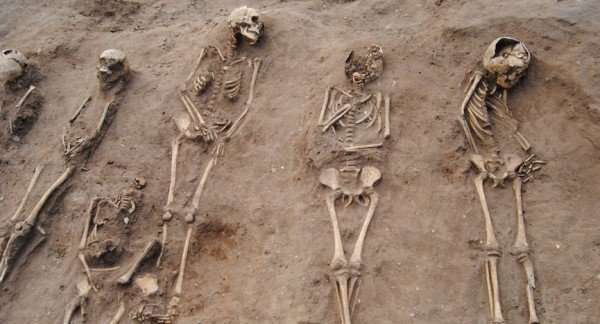 A mass burial of bodies, known to be victims of the Black Death, has been discovered at the site of a 14th-century monastery hospital at Thornton Abbey, Lincolnshire. Archaeologists from the University of Sheffield revealed 48 skeletons, many of which were children, at the extremely rare Black Death burial site. The Black Death was one of the worst pandemics in human history. It devastated European populations from 1346-1353 and resulted in the deaths of an estimated 75 to 200 million people. The presence of such a large burial site, containing both male and female adults, as well as 27 children, suggests the local community was overwhelmed by the Black Death and was left unable to cope with the number of people who died. Dr Hugh Willmott from the University of Sheffield's Department of Archaeology, who has been working on the excavation site since 2011, directed the excavations and explained why the find is of national importance. "Despite the fact it is now estimated that up to half the population of England perished during the Black Death, multiple graves associated with the event are extremely rare in this country, and it seems local communities continued to dispose of their loved ones in as ordinary a way as possible," he said. "The only two previously identified 14th-century sites where Yersinia pestis (the bacterium responsible for the plague) has been identified are historically documented cemeteries in London, where the civic authorities were forced to open new emergency burial grounds to cope with the very large numbers of the urban dead. "The finding of a previously unknown and completely unexpected mass burial dating to this period in a quiet corner of rural Lincolnshire is thus far unique, and sheds light into the real difficulties faced by a small community ill prepared to face such a devastating threat." Dr Willmott added: "While skeletons are interesting, they just represent the end of somebody's life and actually what we are interested in as archaeologists is the life they led before they died. "One artefact that we found at Thornton Abbey was a little pendant. It is a Tau Cross and was found in the excavated hospital building. This pendant was used by some people as a supposed cure against a condition called St Antony's fire, which in modern day science is probably a variety of skin conditions. "Before we began the dig the site was just an ordinary green field grazed by sheep for hundreds of years, but like many fields across England, as soon as you take away the turf, layers of history can be revealed by archaeology." Teeth samples from the skeletons found at the Thornton Abbey site were sent to McMaster University in Canada where ancient DNA was successfully extracted from the tooth pulp. Tests on the DNA revealed the presence of Yersinia pestis, which is documented to have reached Lincolnshire in the spring of 1349. Dr Diana Mahoney Swales, from the University of Sheffield's Department for Lifelong Learning, who is leading the study of the bodies, said: "Once the skeletons return to the lab we start properly learning who these people really are. "We do this by identifying whether they are male or female, children or adults. And then we start to investigate the diseases that they may have lived through, such as metabolic diseases like rickets and scurvy which are degenerative diseases for the skeleton. However for diseases such as plague, which are lethal, we have to use ancient DNA analysis to investigate that further."